Members of Achill Wheelers launching the Tour de Achill Cycle Sportive which takes place on September 1. One of Ireland’s most picturesque cycle sportives, the Tour de Achill, which takes in routes along the Wild Atlantic Way, will take place next Saturday, September 1. The Tour de Achill, hosted by the Achill Wheelers Cycling Club, takes in some of the most stunning scenic routes along the Wild Atlantic Way. Now in its fourth year, the sportive is open to cyclists of all standards and is regarded by many as one of the most scenic and challenging sportives in the cycling calendar. The three route options available are a 38k, 65k and 110k cycle and all will be along the Wild Atlantic Way with stunning coastal views of Clew Bay and Blacksod Bay and Achill’s Blue Flag beaches. The Tour de Achill has attracted cyclists from all over Mayo as well as parts of Ireland and abroad and Achill Wheelers Cycling Club Chairman, Seán Lyons, is excited to welcome returning and new cyclists to this year’s tour saying: "Achill has become a very popular destination for cyclists in recent years with so much to offer cyclists of all standards. 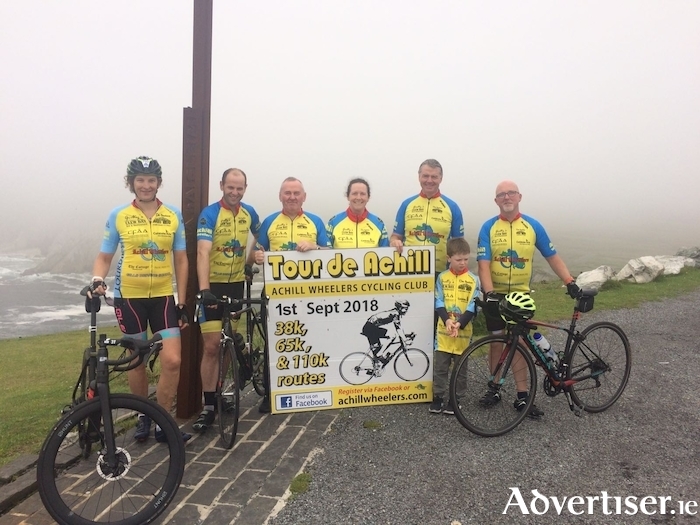 "Whether you are a leisure cyclists who just wants to enjoy the views of our stunning coastline, or a more serious cyclist who looks to challenge yourself against the hilly terrain, Achill has it all to offer. This year the tour will start at the new Achill GAA clubhouse at the entrance to the island at 9.45am and all cyclists will make their way around the Currane Peninsula and back onto the island. The 38k cycle will be completed on the return to the clubhouse while those taking the 110k and 65k options will continue along the stunning Atlantic Drive. After completing the Atlantic Drive, the 65k cyclists will return towards the clubhouse while the 110k cyclists will head towards Keem Bay in Dooagh. After a food stop in Gielty’s Clew Bay Bar in Dooagh, cyclists will then travel around the historic Deserted Village and make their way past the Silver and Golden Strands in Dugort before cycling out towards Achill Sound and the finish. There will be lot of water and refreshments at various stages along the route and there will be a free hot meal for every cyclist when they complete their cycle. To register for Tour de Achill visit the website www.active.com or alternatively register before the cycle at the GAA clubhouse with registration opening at 8am. For more information visit the Achill Wheelers Facebook page or Tour de Achill event page.